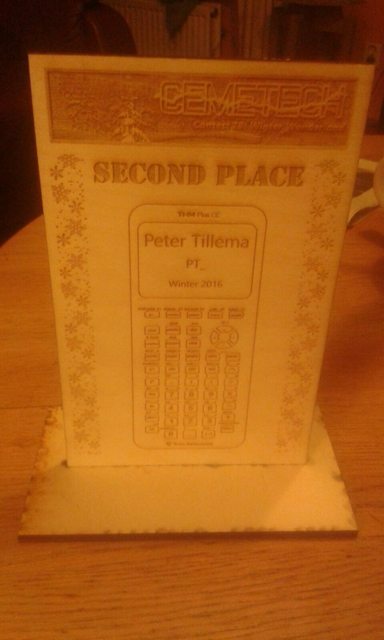 It is my pleasure to present the official results of Cemetech Contest #18: Winter Wonderland. Over the course of four weeks, the contestants were each tasked with creating three programs - each with a unique theme and purpose. This contest resulted in the creation of nearly a dozen entries, spanning three different platforms and four programming languages - many of which are now available in the Cemetech Archives. Despite the chilling properties of last week’s submissions, I have succeeded in reviewing all of the entries and have reached a decision. I have been quite impressed by the high quality of the programs submitted for this contest, and I would like to extend my congratulations to all of the participants. ▪ For the first week of the contest, Pieman7373 created a Snowflake matching game which requires the player to match any identical snowflakes to clear the board. This game features 18 different snowflake patterns and is sure to provide plenty of mentally stimulating gameplay. ▪ Considering the fact that cupcakes are an essential component of any party, Pieman7373 has created a “cupcake simulator” that will enable calculator users throughout the world to design custom cupcakes suited perfectly to their needs. If you are an 8-bit cupcake fan, Cupcake Simulator should surely find its way onto your TI-84+CSE. ▪ For the final week of the contest, Pieman7373 created a science utility that conveniently displays the freez(e)ing point of the elemental metals. The program includes everything from commonly known metals like lithium and aluminum, to less commonly known metals like “Bisμth.” Freezing Point is currently available in the Cemetech Archives. Second place is awarded to PT_, who created three programs for the TI-84+CE in ICE - a programming language that PT_ has also developed. These entries include the spectacular Snowball Struggle and a sliding puzzle. ▪ In Snowball Struggle, the player attempts to destroy bouncing snowballs while avoiding being crushed by one. Snowball Struggle features 17 levels, and is available for download in the Cemetech Archives. ▪ For the second week of the contest, PT_ created a sliding tile game where the player must unscramble an image of a present by sliding tiles back and forth one at a time. The game is easy to use and features a built-in scrambling routine. ▪ PT_’s third entry was intended to provide fun and excitement as the faces of various Cemetech members (including myself) freeze over in the frigid winds of the Polar Vortex. Unfortunately, a bug in the ICE programming language rendered this entry inoperable. ▪ Kydapoot, who created a dodgeball-type snowflake avoidance game, and a fancy digital clock that displays the present time. ▪ Calcnerd_CEP_D, who created game which involves precisely catching delicate snowflakes before they hit the ground, a party balloon themed screensaver, and a program that literally freezes the calculator. Great job everybody! Congratulations, Pieman and PT_! YAY!! Thank you everyone for supporting me through this contest, i never would have bennn able to do it without you!! And thank you to PT_ and Kydapoot and Calcnerd for helping as well! I never thought that i would win first place! Congrats everyone!! You guys really deserved it! You make my programs sound a lot better than they are. I'm just glad I did better than last time. Congratulations, winners of this contest! And of course, good job to all those who participated. Awesome job to all the participants! Everybody's program's looked really good! That just reminded me though, were userbars ever made for CC17? And I will have a beautiful "Honorable Mention". It looks great! Good job jonbush, and congrats PT_! There are 226 users online: 14 members and 212 guests. © Copyright 2000-2019 Cemetech & Christopher Mitchell :: Page Execution Time: 0.502527 seconds.